Trail mix is the perfect snack. Diverse, healthy, and most important of all – portable. It’s perfect for your morning commute or mid-afternoon power-up. Take it on a hike, or indulge in a bowl on the couch as you work your way through a Netflix marathon. The key to solid trail mix is combining unlikely ingredients. Mix and match nuts, seeds, dried fruit, grains, sweets, and savory extras for a filling and complete snack. 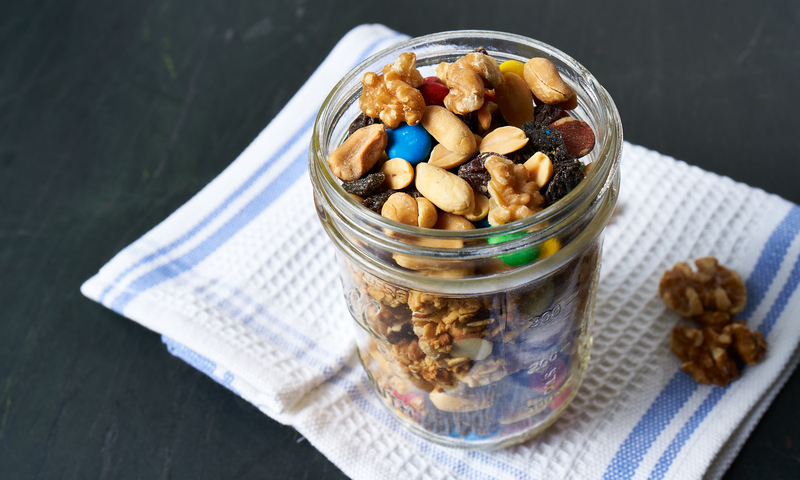 We put together some of our go-to trail mix combinations, ready for your next adventure. The dried cherries add sweetness, while the sea salt gives it a tang of savory. Almonds will keep you filled for longer, making your work afternoon a whole lot shorter. The mix of spices in this one will have your hand reaching back into the bag time and time again. Omit the cayenne pepper if spice isn't your thing, and add a little extra garlic powder instead. Savory and delicious. It's just like having the sandwich without the mess. The raisins give you the familiar tang of the jelly, and the peanut butter chips are the perfect creamy counterpart. Add in the dried bananas for a little Elvis flair. Okay, so this one might not be the healthiest, but it's an indulgent snack worth it every once and a while. Plus, there is nothing better than melty chocolate over your still-warm popcorn. Skip the microwave bag and air pop your own popcorn to save some calories. Enjoy a little taste of the Louisiana coast with this salty, spicy treat. Mix and match your nut selection based on preference. Your Mardi Gras beads are optional. What is your trail mix favorite? Share your recipes with us by following us on social @prometheus_apartments and tagging your images with #SeasonsofUs.